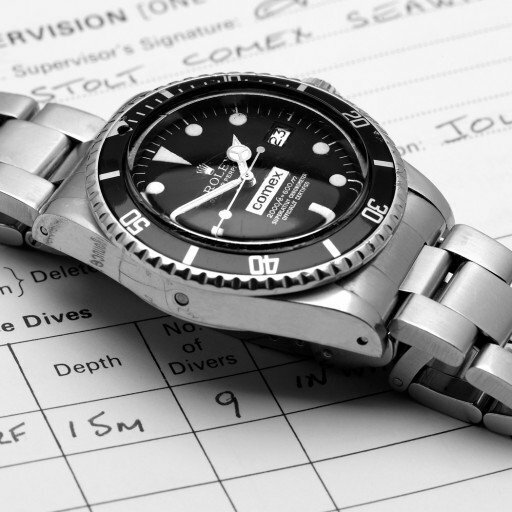 In this post we’re picking up where we left off with the Submariner history last week. The history of the Submariner morphs into the history of the Sea-Dweller rather smoothly. Or perhaps we should say, the Sea-Dweller branches off the Submariner line like a mathematical tangent. There’s nary a bump to let you know you’ve diverged. 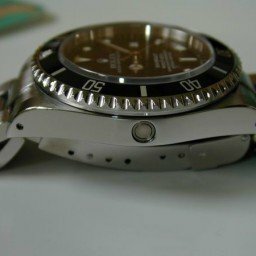 So what is the Sea-Dweller and how does it relate to the Submariner? 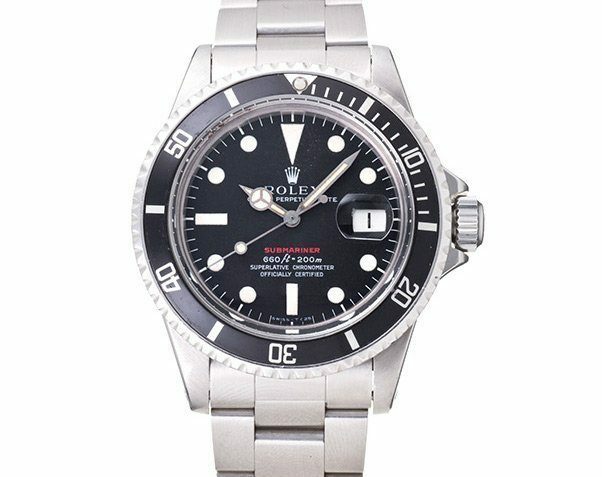 Well, if the Submariner is the genre-defining tool watch, the Sea-Dweller is the wild little brother who got left behind on a family camping trip and was raised by wolves. Our story begins, not in the ocean depths, but on the newly created and built four-lane super slabs crisscrossing America, known as the Interstate Highway System. All those newly-minted V-8 engines fed by Holley double-pumper four barrel carburetors and propelling Chevys, Fords, and Mopars across the U.S. at speeds encroaching on three digits were sucking up oil faster than it could be pumped out of the ground. So new sources of crude needed to be found to feed America’s new drug habit – the two week summer vacation. Oil companies looked to the deep oceans and when they found what they were seeking, their divers needed a watch up to the task. The actual branching took place in 1967, with a watch that was signed ‘Sea-Dweller, Submariner 2000” in red. This was the famous ‘double red’ Sea-Dweller. It was essentially a ref. 5513 Submariner with a helium escape valve. Here, we should back up a bit. With that big demand for oil and working deeper in the oceans than ever, divers were saying at depths for weeks on end, in submersible chambers from which they commuted to work each day. These chambers were kept at the same high pressures as the surrounding sea depth, so divers wouldn’t have to waste precious minutes decompressing just to get back in the chamber at shift’s end. The nitrogen in the air in these chambers was replaced with helium for its friendlier properties at such working pressures. But the helium molecule is one of the smallest molecules in nature. Helium gas would infiltrate the watches during their weeks at pressure and later on, when the divers were decompressing on the surface after their tour of duty, crystals began explosively popping off watches right and left, all due to the buildup of helium inside the watch case. French dive company Comex didn’t like that. So they teamed with Rolex to come up with a solution: the so-called helium escape valve. This was a one-way valve, water tight to the rated depth, but allowing the built-up helium inside the case to escape during the depressurization process at the end of each tour of duty. The resulting watches are signed COMEX in black letters on a white field on the dial. Early versions were only stamped similarly on the case backs. 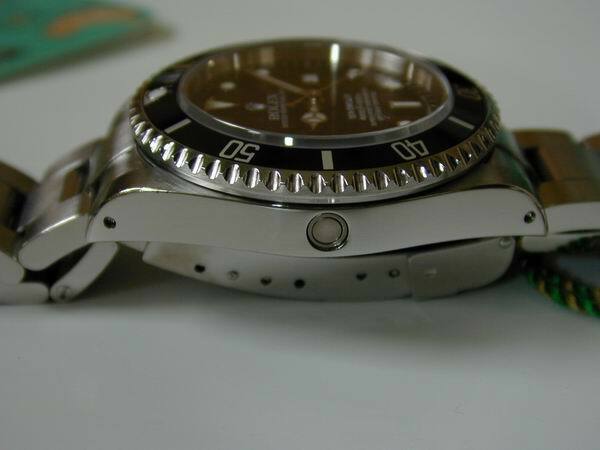 At least into the mid 1990s, no Comex diver was allowed to enter the water without such a watch buckled to his wrist. All such watches were removed from active duty and serviced every six months. Thus, most any Comex you find will have been updated with quickset movements, dials, bezels, hands, etc. as (we know all too well) Rolex is loathe to let a watch leave their service center with less than the latest and the best. The ref. 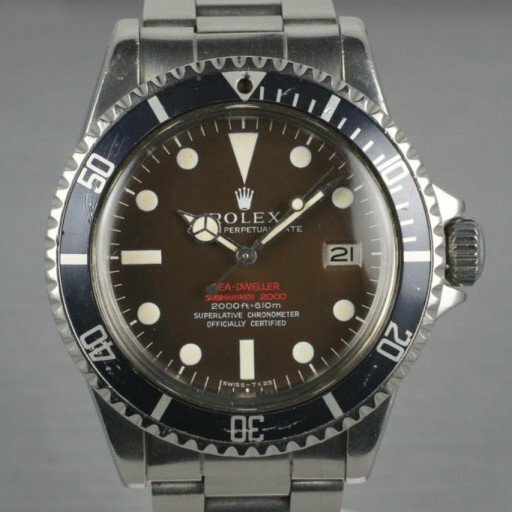 1665 Submariner Sea-Dweller appeared in 1971, in a heavier case than that of the Submariner and with that helium escape valve. 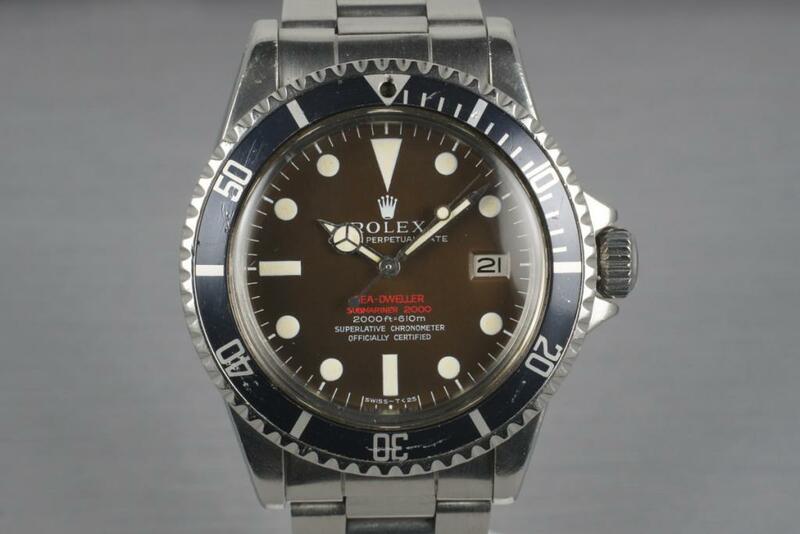 The two lines of red lettering stayed until 1973 when the ‘Submariner 2000’ portion disappeared. But beyond that, the Sea-Dweller remained untouched until 1980 when it got a significant update. That year, the date mechanism became a quickset, the crystal was now sapphire, and the He valve was revised. All this gave the watch a depth rating of 4000 feet or 1220 meters. The Sea-Dweller line continued through the 1990s and into the 2000s with only small evolutionary changes. It remained nearly unchanged for almost three decades. Sadly, the Sea-Dweller was discontinued in 2008, much to the chagrin of fans. Meanwhile, the Sea-Dweller Deepsea, ref. 116660 appeared at the same time, in 2008. It sported a depth rating of 3900 meters and featured a unique multi-piece case back and a 5.5mm thick domed crystal. Movie maker James Cameron subsequently took an experimental version to the bottom of the Challenger Deep – on the outside of the DSV Deepsea Challenger. 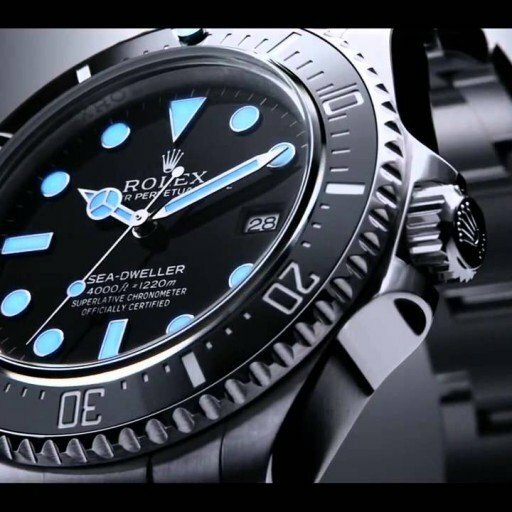 Finally, Rolex announced the return of the Sea-Dweller, the 4000 at Baselworld in 2014. But what of the main Submariner line? Well, things were happening there too. The Red Sub, ref. 1680 was released in 1971 but had only a brief four year run. As such, it’s one of the most collected Submariners out there. 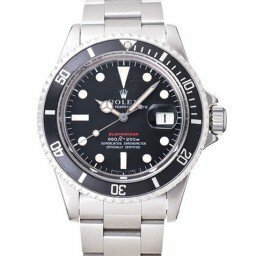 Rolex continued its policy of gradual improvements thorough the 1980s and 1990s. both date versions and no-date versions were available, as were white gold, yellow gold, and two-tone versions. The ref. 14060 was released in 1990. This reference had no date, and represented the “everything you need, nothing you don’t” esthetic to a T. It was updated with a newer movement and a new reference number, 14060M, which ultimately was available in both chronometer and non-chronometer versions. We’ve heard this watch called “the last of the best” by aficionados because ref. 114060 replaced it in 2012. The 114060 was packed into the new “super case” which had seen partial release in 2008. This new watch featured thicker lugs, a ceramic bezel, a Parachrom hairspring and an improved bracelet with Rolex’s new Glidelock extension system. In 2003, an anniversary edition, ref. 16610 LV was released in a limited run. The watch was equipped with a green bezel insert and a ‘maxi’ dial. This wraps up our look at the histories of Rolex-proper models. We hope you’ve learned a little something about your favorite Rollie. Now we’re going to take a little break from history to do a little live blogging. For the next week, we’ll be touring the Tucson, Arizona gem and jewelry shows. But we haven’t forgotten about you Tudor and Cellini lovers. Stay tuned after the Tucson coverage for histories of those two brands. Ever wonder about the backstory of your favorite Rolex? We hope you’ve been sticking with us. This is the seventeenth in an ongoing series of posts featuring histories of significant Rolex models. In all, Rolex has introduced nearly three dozen models since 1950. Ultimately, we’ll be touching on nearly all of them. You’ll find all the reference numbers connected with each model here.